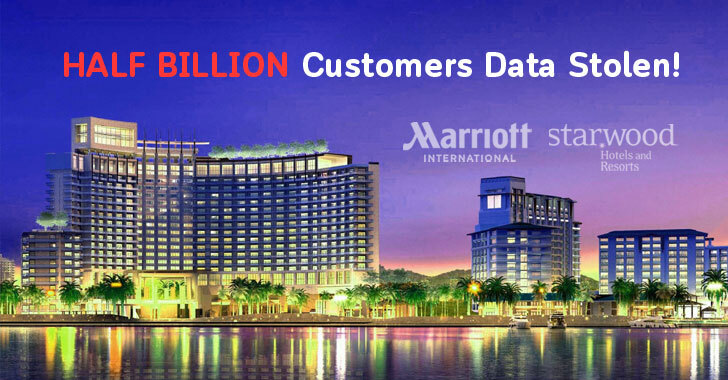 The world’s biggest hotel chain Marriott International today disclosed that unknown hackers compromised guest reservation database its subsidiary Starwood hotels and walked away with personal details of about 500 million guests. Starwood Hotels and Resorts Worldwide was acquired by Marriott International for $13 billion in 2016. The brand includes St. Regis, Sheraton Hotels & Resorts, W Hotels, Westin Hotels & Resorts, Aloft Hotels, Tribute Portfolio, Element Hotels, Le Méridien Hotels & Resorts, The Luxury Collection, Four Points by Sheraton and Design Hotels. The incident is believed to be one of the largest data breaches in history, behind 2016 Yahoo hacking in which nearly 3 billion user accounts were stolen. The breach of Starwood properties has been happening since 2014 after an “unauthorized party” managed to gain unauthorized access to the Starwood’s guest reservation database, and had copied and encrypted the information. The stolen hotel database contains sensitive personal information of nearly 327 million guests, including their names, mailing addresses, phone numbers, email addresses, passport numbers, dates of birth, genders, arrival and departure information, reservation date, and communication preferences. What’s worrisome? For some users, stolen data also includes payment card numbers and payment card expiration dates. “The company has not finished identifying duplicate information in the database, but believes it contains information on up to approximately 500 million guests who made a reservation at a Starwood property,” the company said in a statement. Marriott confirmed that its investigation into the incident only identified unauthorized access to the separate Starwood network and not the Marriott network. It has also begun informing potentially impacted customers of the security incident. The hotel company has begun notifying regulatory authorities and also informed law enforcement of the incident and continues to support their investigation. Posted in Blog, News and tagged 500 million guest hacked, Aloft Hotels, Element Hotels, European Union's General Data Protection Regulation (GDPR), Four Points by Sheraton and Design Hotels., Le Méridien Hotels & Resorts, Marriott International hacked, Sheraton Hotels & Resorts, Starwood Hotels and Resorts Worldwide, starwood properties, t. Regis, The Luxury Collection, Tribute Portfolio, W Hotels, Westin Hotels & Resorts.